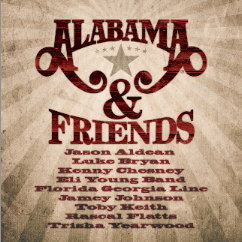 ALABAMA & Friends – the new tribute album honoring country music’s most iconic group ALABAMA – will be made available for digital pre-orders starting August 13 through iTunes. Fans can access the pre-ordering of the album before it hits the streets on Tuesday, August 27 by visiting iTunes. Special bundle packages are available now via the group’s official website www.thealabamaband.com. The “Ultimate Bundle” package consists of a vintage ALABAMA baseball tee, an ALABAMA & FriendsCD and vinyl LP for $50.00. A vintage tee and CD package is also available for only $35.00. Orders are expected to arrive on album release day or soon after. ALABAMA & Friends features some of country music’s hottest stars delivering their own unique versions of ALABAMA classics, including Jason Aldean (“Tennessee River”), Luke Bryan (“Love in the First Degree”),Kenny Chesney (“Lady Down on Love”), Eli Young Band (“The Closer You Get”), Florida Georgia Line (“I’m in a Hurry (And Don’t Know Why)”),Jamey Johnson (“My Home’s in Alabama”), Toby Keith (“She and I”),Rascal Flatts (“Old Flame”) and Trisha Yearwood (“Forever’s As Far As I’ll Go”). The 11-song collection will also feature two new songs from ALABAMA – “That’s How I Was Raised” and “All American.” It’s the first taste of new music from the legendary and award-winning group in over a decade. After signing with RCA in 1980, ALABAMA soared to the top time and again with 21 No. 1 hits in a row. They have had 43 chart-topping singles and have sold more than 73 million albums worldwide. They have won more than 150 major industry nods, including two Grammys, the Minnie Pearl Humanitarian award, Entertainer of the Year awards three times from the CMA and five times from the ACM, as well as the ACM Artist of the Decade award. The Hall of Famers have earned 21 Gold ®, Platinum ® and Multi-Platinum ® albums, and were named the RIAA’s Country Group of the Century. ALABAMA is currently in the midst of theirBack to the Bowery Tour that has them playing to capacity crowds all across the country since its launch earlier this year. The new tour will continue through the fall, making stops in cities including Detroit, Greenville, SC, St. Louis, MO, Nashville, TN and Birmingham, AL. For more of the latest news and a complete listing of tour dates visit www.thealabamaband.com.